Learn the secrets to designing show-stopping monochromatic arrangements in this spectacular guide from floral artist Kiana Underwood. Kiana shares her techniques for creating dazzling single-color displays using inspired ingredients, dramatic textures, and vibrant colors. Organized by season, the book includes how-tos for 40 arrangements - including a lush green display for spring, an astonishing black bouquet for summer, a striking magenta design for fall, and an unexpected, oh-so-pretty pink arrangement for winter. 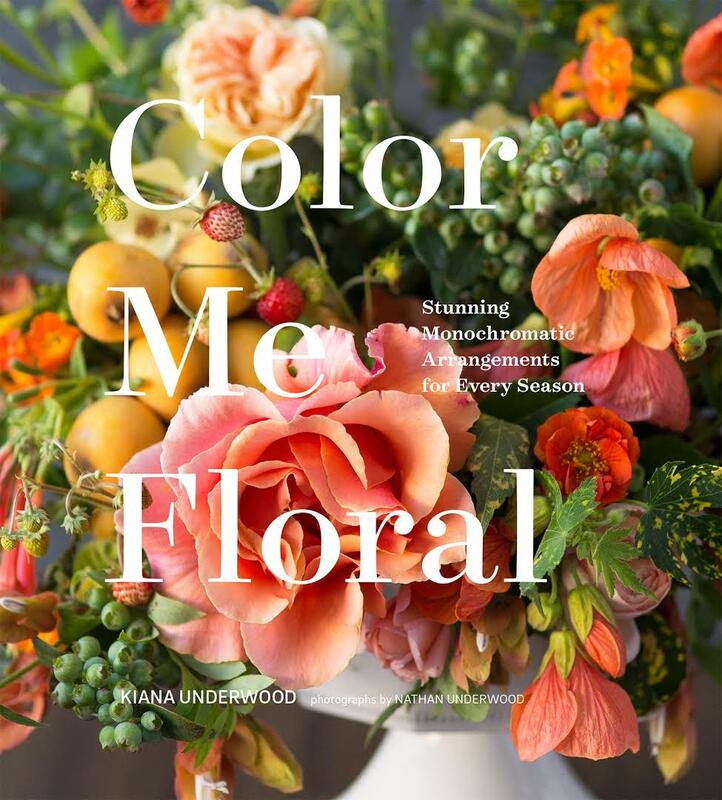 Featuring hundreds of eye-catching images and easy-to-follow tips throughout - such as suggestions for substituting flowers and options for both the beginner and advanced designer—this book is as useful as it is gorgeous. The ultimate resource, Color Me Floral has an extraordinary arrangement to enhance every occasion. ...and wherever books are sold. We began shooting Color Me Floral in May, 2016. When I first thought about writing a book, I thought "how hard could it be?". How wrong I was. The process of completing Color Me Floral was one of the most challenging things I have done in my career. Getting a literary agent, putting together a book proposal (which requires quite a bit of creative work), shopping it to publishers, and completing contracts are each worthy of their own blog posts. To begin, my husband Nate photographed the initial 10 page book pitch, and once we signed with the publisher, they really wanted it to look just like the proposal. Nate tried to convince them that having another (professional - his words) photographer would be a great idea, but they wanted him to shoot it (and so did I, secretly), so that was that. At the time, Nate had a full-time job as a technology executive - working 50+ hours a week, and we had to be creative about when we could shoot. No weekdays. So, we shot on weekends. With 10 colors and four seasons, it was clear that it was going to take nearly a full year to photograph everything - which it did. With weddings, events, and teaching - we couldn't shoot every weekend, and so worked on our off Saturdays (and most often Sundays) to try and knock out 1-3 shoots at a time. It was grueling, but as we started to go through the images, we knew that it was going to be worth it. About 60% through our shooting schedule, the building our studio was in - the one with the rainbow stairs - caught fire and mostly burned down. It was tragic. We had dialed in our shooting times for the right light, and had our little "book corner" all set up. We had to move, and not only find a new place to call home for the business, but also for finishing the book. We did eventually find a new studio, and set back to work. One evening after meetings, I had Nate's camera bag in the car and forgot to take it with me while out to dinner. When I came back 45 minutes later, the car window was smashed and the camera bag was gone. Thousands of dollars in camera gear, and 5 shoots that hadn't been transferred to backup were lost. It was devastating. Nate took it hard, as he had everything set up specifically for the book from a gear perspective, and insurance wouldn't pay for any of the losses. He was more upset about the lost shoots though - more than 10% of the book and a month of work were gone (Nate reminds you to back up your work religiously!). We ended up finishing the book with one of our video cameras and manual focus cinema lenses (which Nate could write a whole blog post on). Next, the writing, and editing, and rewriting, and editing, and more editing. The layout and editing process took six months total - but again, the results were worth it. Finally, Color Me Floral is here. It was a true labor of love, and I made it for you. It was the book I wanted when I was starting out, and I hope it will not only be a beautiful addition to your coffee table book stack, but that you find it truly useful and inspiring, and a reference for years to come!